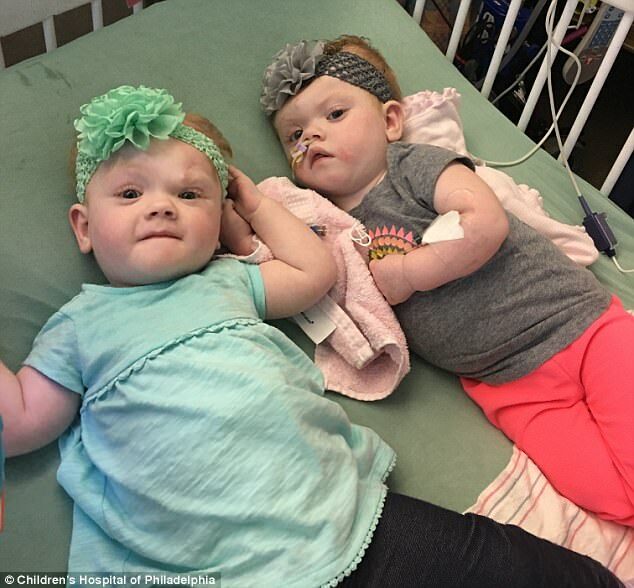 A set of two-year-old twin girls who were born with connected brains are now developing like any other kid their age, astounding doctors. Erin and Abbey Delaney underwent one of the riskiest separation surgeries ever, with a significant chance that one of both wouldn't make it. Now, a year-and-a-half after their 11-hour operation in Philadelphia, the once-conjoined girls are thriving at home in North Carolina. 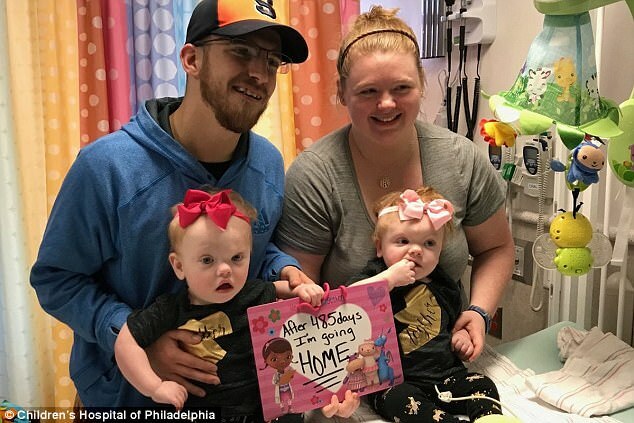 'They're just growing and changing and amazing little people and I can say they are really my heroes for what they have been through,' Heather Delaney told CBS News. Their progress has left doctors both in awe and inspired by the potential of future separation surgeries, since theirs was such a breakthrough. 'Some of the stuff they were doing had never been done before so we didn't know how it was going to work out,' Heather said. 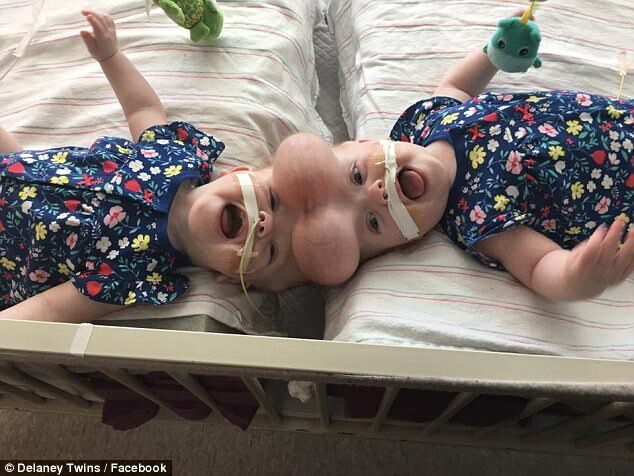 The one-year-olds were born on July 24, 2016, via Cesarean section as craniopagus twins, which is the most rare form of conjoined twins where they are attached at the top of the skull. They were 10 weeks early and weighed two pounds each. Surgeons at the Children's Hospital of Philadelphia separated the twins on June 7, 2017, when they were 11 months old, making it one of the earliest separations of craniopagus twins ever. After, Erin's recovery was smoother because she had more of her skull intact than Abby. Abby, on the other hand, has had a tougher road where she has battled a brain bleed and multiple infections. Surgeons say they are optimistic about both of them recovering well - a feat they weren't always 100 percent certain would be possible. 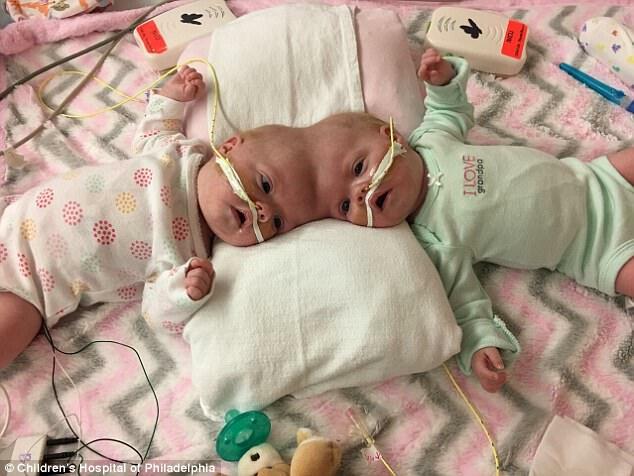 Craniopagus conjoined twins is the rarest form where the babies are connected at the cranium. Doctors warned parents Heather and Riley, from Mooresville, North Carolina, that separation surgery could kill one or both of the twins. 'This is scary, and we're scared, but we can't let fear limit our ability to operate. We have to do the operation that needs to be done,' said neurosurgeon Dr Gregory Heuer to CBS News. Dr Heuer and his team inserted a balloon into the twins' skulls to help expand the skin before the separation surgery. This procedure stretched the skin around that area in preparation of separating the heads. The surgeons performed the surgery earlier than others because younger children have a better chance of surviving and healing. The Children's Hospital of Philadelphia had previously performed 24 separation surgeries, and it formed a team of about 30 people for the lengthy procedure. During the surgery, the surgeons almost lost Abby because she started severely bleeding after she was separated from her sister. Because of how the twins were attached, Erin received the sagittal sinus instead of Abby. The sagittal sinus is responsible for draining the blood from the brain and cranial bones. This impacted Abby's recovery in the months after the surgery. 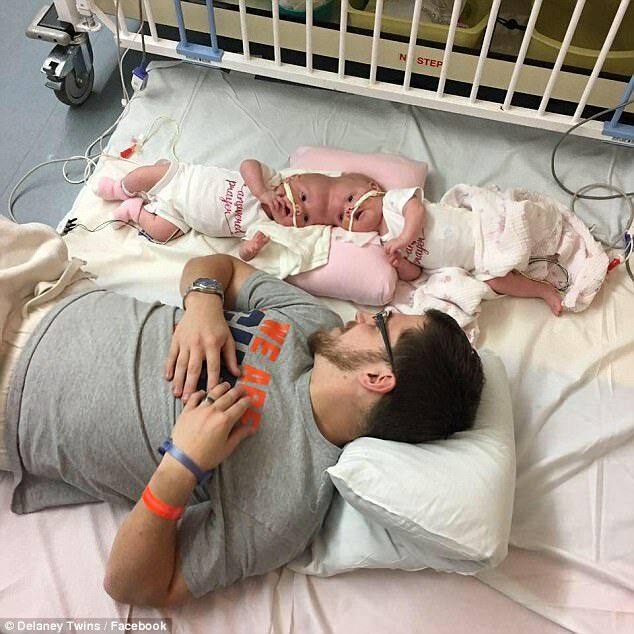 Both twins were put into an induced medical coma for a week after the procedure to help their brain's recover from the separation. Erin's coma was lifted first and Heather, her mother, was able to hold her for the first time. Abby was taken out of her coma that same day, just a couple hours after her sister. The biggest worry after the surgery was the twins could contract an infection in their brain around the area that was operated on. To prevent this from happening, hospital staff washed Erin's brain once and Abby's twice to keep the area as clean as possible. Since then, Abby has had a harder time recovering than her sister. She has suffered from a brain bleed, three respiratory viruses, a blood infection and other complications that have kept her in the hospital for longer. Both of the twins are going through occupational, physical and speech therapy to gain functions that were unattainable while attached. Over the next few years, the twins are expected to have plastic and reconstructive surgeries to replace some of the missing bones in their skulls. 'The girls are inspiring,' Heather said to Fox 29. 'As their parents, it is very neat for Riley and me to have a front row seat to this and watch them overcome these incredible obstacles.